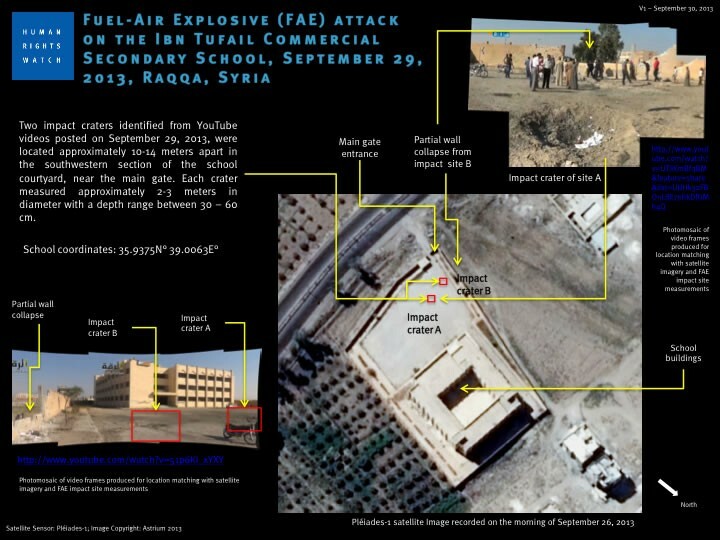 The Syrian air force jet screamed over the Ibn Tufail Commercial Secondary School in the city of Raqa, in Syria’s rebel-controlled north, at around 8:05 in the morning on Sept. 29. It released two bombs. In a thunderclap of noise and fire, at least 14 people died—12 of them students on their first day of class, according to Human Rights Watch. The Syrian air force—regime Pres. Bashar Al Assad’s most powerful weapon—has killed uncounted thousands of rebels and civilians in two years of aerial bombardment. But the school bombing was special, although tragically not unique. The munitions used were apparently fuel-air explosives, a particularly cruel type of weapon meant for killing soldiers in bunkers. A fuel-bomb canister releases a fuel mixture that blends with the air; a charge ignites this mixture, essentially exploding the atmosphere over a large area. Al Assad’s regime has reportedly used fuel-air bombs before, but appears to dropping them more frequently now that the world is alert to any use of chemical weapons. A major regime gas attack in Damascus in August killed more than 1,400 people and precipitated a diplomatic crisis. The fuel bombs are an effective stand-in for chemical weapons because they, like gas, can kill lots of people over a large area. “Prone to indiscriminate impact in populated areas” is how Human Rights Watch characterizes the munitions, which are also known as “thermobaric” bombs. Pro-regime Websites claimed another fuel-bomb use on Oct. 3. A regime warplane reportedly targeted a meeting of several dozen rebel commanders in the northern town of Al Rawdha. “Chief of the Syrian Air Force, Lt. Gen. Issaam Hallaaq, was given the task of directing a strike by dropping a thermobaric bomb on the suspected location of the meeting,” Syrian Perspective reported. The regime’s switch to devastating fuel-air bombs comes amid mounting evidence that its earlier chemical campaign was more widespread than originally believed outside Syria. The world has focused its disapproval on the August gas attack, but no fewer than three rebel fighters and aid workers have told War Is Boring that they were gassed on separate occasions prior to the use of chemical agents in Damascus.